Rancher and Montana legislator Bill Richardson shows UNH Sustainability Institute fellows and One Montana staff the day-to-day operations of his ranch. For Tegan O’Neill ’14 ’16G, sustainability is just as much about building social relationships as it is about environmental impacts. It’s a lesson she learned firsthand as a 2014 UNH Sustainability Fellow. That year, she worked with the nonprofit One Montana, researching how climate change impacts the Mountain West and building networks among stakeholders. At One Montana, and at organizations across the country, O’Neill and other sustainability fellows bridged those gaps, developed sustainability solutions and built a professional network in the sustainability community. During the 10-week fellowship, O’Neill met the Montana farmers and ranchers who saw the effects of climate change every day. Part of the challenge, according to O’Neill, was to connect agricultural leaders with state officials, many of whom had never met each other. Facilitating those conversations required finding common ground. “To bring folks together, we had to talk about water and weather variability … you have to be willing to adopt a different perspective that makes sense to the people you’re working with, and let go of preconceived ideas about how to talk about or deal with climate change,” she says. Sustainability fellowships are open to graduate and undergraduate students. Fellows are paired with mentors in the field and have the chance to work on projects at the forefront of sustainability efforts. 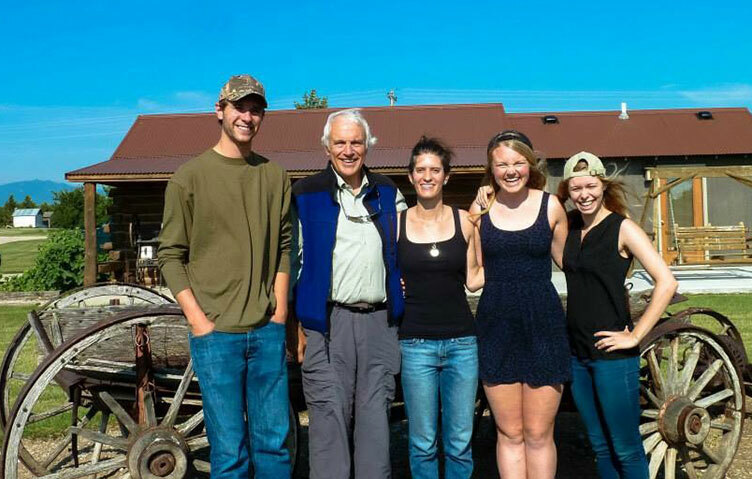 Tegan O’Neill ’14 ’16G (far right) worked with the nonprofit One Montana as a 2014 UNH Sustainability Fellow. "Building a professional network in the sustainability community can be challenging. The beauty of the fellows program is that it provides an opportunity to complete a meaningful project with lasting impact and build a network of peers and mentors. Fellows get to know their project mentors well and project mentors take the role of welcoming fellows into the sustainability community seriously," says Tom Kelly, executive director of the Sustainability Institute and chief sustainability officer for UNH. Now working with NextGen Climate, O’Neill says her fellowship experience continues to influence her current sustainability work. Sustainability fellowship projects have real community impact. Dovev Levine ’00 ’15G was a 2008 sustainability fellow. He worked with the New Hampshire-based Clean Air Cool Planet and compiled case studies on sustainability programs in New England communities. One of the programs he researched was a community-based solar development project in Plymouth, New Hampshire. The program offered low-cost solar hot water systems to participants if they agreed to help install similar systems in homes in their neighborhood. Levine returned to the fellowship program as a mentor in 2016, and he plans to mentor fellows this year as well. The network of mentors and past fellows is critical for students pursuing careers in sustainability, according to Levine. O’Neill agrees. “It’s a really strong network to have once you’re out in the world. The fellows who were part of my cohort are all doing really cool, really important things,” she says. Learn more about the Sustainability Institute.